Before the onset of World War II in the Pacific in late 1941, Batangas was one of the most bustling provinces in the country in terms of commerce and industry. World War II and the Japanese occupation changed that. The invading army forced themselves into local households, seizing food and belongings. Particularly towards the end of the war when the Americans marched into Luzon, the Japanese engaged in drunken orgies of killing, in total wasting the lives of an estimated 25,000 Batangueños. The fighting caused the destruction of roads and bridges as well as telephone and telegraph lines. Sto. Tomas, Tanauan, Malvar, Lipa, San Jose, Lipa, Lemery, Rosario, Batangas, Bauan, Cuenca, Alitagtag and San Luis were totally devastated, along with industries located in these municipalities. Economic activity dwindled almost to a standstill also due to the dearth of manpower. Those among the province’s men who survived the Japanese massacre mostly preferred to work in the military where the remuneration was better. 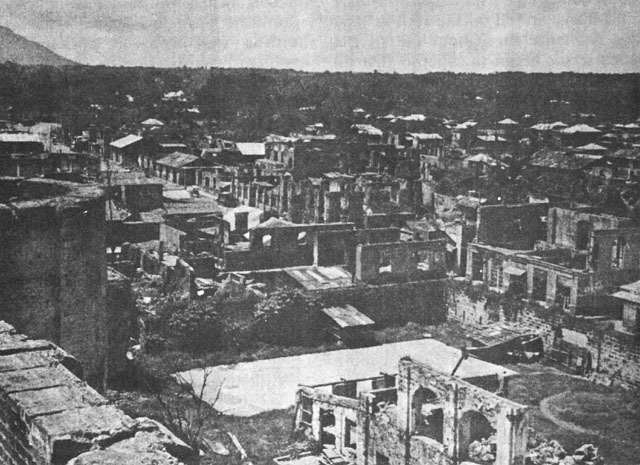 After the conclusion of the war, the Commonwealth Government set about the task of rebuilding the country, including the heavily devastated Province of Batangas. With the assistance of the United States Army’s engineering corps, roads, bridges, public offices and communication lines were rebuilt. Financial aid was extended to owners of commercial and industrial companies, albeit production was stunted by the chronic shortage of manpower in the aftermath of the war. Consequently, the prices of produce skyrocketed. Prices started to tumble upon the flooding in 1946 of the market with goods imported from the United States. To put these “inflated” prices in context, however, I cite stories of pre-war economics I used to hear from my own parents. Then, or so I used to hear, ¢5 had real worth. My parents used to say how such a meager amount – at least by present day standards – was more than sufficient for a meal. One could purchase a cup of rice for ¢1, one viand for another ¢2, soft drink for ¢1 and, if one wanted dessert, perhaps boiled plantain for the final ¢1. In the present day, of course, ¢5 has become next to worthless. Gradually, people turned to the land and home-based industries as their primary sources of income. Embroidery, sinamay weaving and livestock raising became major preoccupations. Batangueños raised cattle, carabaos, horses, hogs, goats, sheep, chicken, duck, geese and even turkeys. Among the major crops were rice, sugarcane, Mandarin oranges, mangoes, coffee, bananas and cassava. 1946 figures showed that horse-drawn transportation was still basically the primary way of moving about, particularly within each municipality. There were a mere 514 registered automobiles in Batangas, along with 1,194 registered trucks and just 4 motorcycles. In contrast, there were 1,107 calesas and 403 carretelas. For entertainment, there were 22 registered show houses or theaters in the province, at least one in each municipality excepting Batangas and Lipa where there were four each. These days, of course, at SM City in Lipa alone, there are already 4 moviehouses. 1 2015 Philippine Population Census, online at the Philippine Statistics Authority web site. 2 Department of Labor National Wages and Productivity Commission web site. 3 Batangas Fact Sheet, online at the Philippine Statistics Authority web site. 4 All other information in this article from “The 1948 Batangas Provincial Directory,” Emilio Ynciong, Ed.